Starting with this we’re going to take a little different approach to our fishing report. It is our objective to post an updated fishing report on a weekly basis throughout the summer season. We’ll move to bi-weekly in the fall and spring and less in the winter. Our past protocol has been to list all of the major areas with a short paragraph about each. Our area of operation has become so vast; especially with the addition of the Teton River last summer, that it isn’t practical to write something about every spot in our region. Instead we plan to consolidate the report to highlight some of the best options for the period. Please click the highlighted links to get more detailed information. The next week to ten days is really tough to predict. Everyone agrees that our spring is two weeks to a month early. The early season Blue Winged Olive, March Brown mayflies and Grannom Caddis came out earlier than I can ever remember. It is important to consider the weather was much warmer than normal for at least a month. The next big thing is the Salmonfly hatch. When will it happen? In my mind, if the weather hadn’t changed to a more normal pattern, the big stoneflies would already be out. We’re looking at some cool, cloudy and hopefully some wet weather for the week ahead but in my mind we’ll be fishing Salmonflies before the week is out. The major focus on the Henry’s Fork will be on the sections of river from the Vernon Bridge to the Chester Dam and from the Stone Bridge below the confluence with Warm River downstream to the county boat ramp below Highway 20. Another good option is from the slide below Lower Mesa Falls downstream to the Stone Bridge. This section is not for the faint of heart. The trail down to the water is 1500 feet down into the canyon at a steep 50% grade. Only soft bottom rafts are legal. Once you get to the river there is some whitewater. It’s not considered expert level but you better know what you’re doing to row it. Other areas of the Henry’s Fork that could produce some good Salmonfly fishing are the rapids below Coffee Pot Campground and the Box Canyon near the campground. The campground is just downstream from the Buffalo River confluence, The Buffalo is a true spring creek and it is usually a few degrees warmer than the main Henry’s Fork. Anglers often get pretty frustrated because of the number of float boats during the Salmonfly hatch. Certainly a lot of locals, both guides and non-guides, anticipate this opportunity. 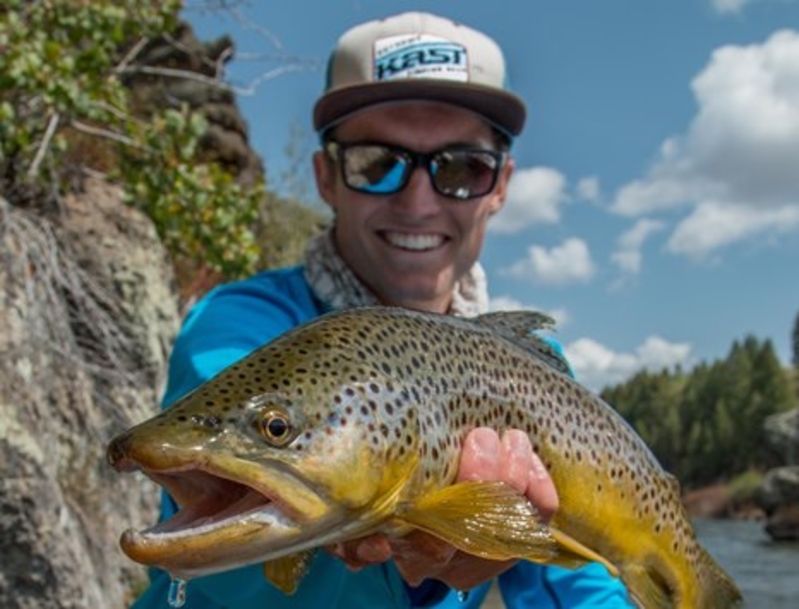 However there are also a lot of boats from Jackson, Bozeman, Salt Lake City, Boise and other population centers who travel to fish the Salmonfly hatch on the Henry’s Fork. It can be very productive in these high traffic areas to stop and work the water. Most of the boaters hit the same spots with similar fly patterns. There are a lot of spots, like below overhanging branches or behind rocks that are almost impossible to get a drag-free drift from a boat. Most of the lower Henry’s Fork flows through private land. 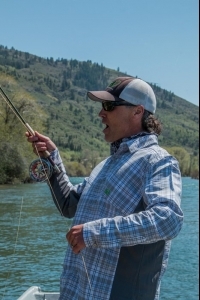 It is important to note that Idaho stream access law requires anglers to stay within the high water mark or receive permission from the landowner. Salmonflies can be very short lived in any section of the water. They normally emerge in heavy concentrations once it starts and are all done within a couple of days. If the weather is warm and stable the emergence moves quickly up the river often several miles each day. 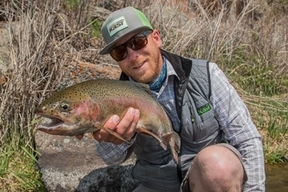 The Henry’s Fork has so many variations of water temperature that the upstream progress of the hatch isn’t as reliable as on some freestone rivers. The peak activity can be in several places at one. Stonefly nymphs and rubberlegs fished into the bank can be very productive in the early stages of the hatch. Dry flies can also bring some very large trout to the surface. There is often a short period, sometimes a day or two, when the large insects are everywhere but the trout won’t touch them. Even though trout are gluttonous, they can get so full they can hardly swim. 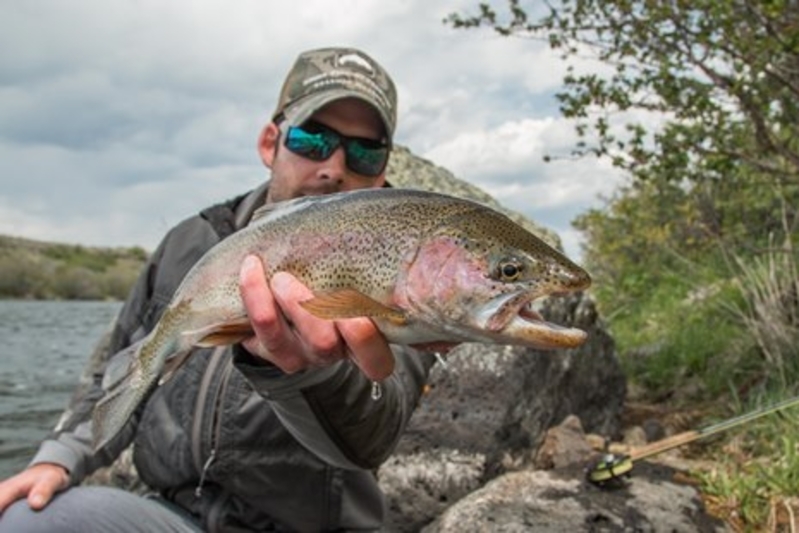 One of the best dry fly periods is after the trout get hungry again when the big bugs aren’t as plentiful. I’ve seen some very realistic nymph patterns but they don’t work any better than the black or brown rubberlegs. If you aren’t losing a nymph on a regular basis you likely aren’t fishing it right. I like size 4 or 6, some heavily weighted and others without a lot of weight. I like to tie the lightly weighted ones with orange thread so I can tell the difference. In the evenings some of the largest trout will move tight to the bank where the unweighted nymphs are most effective. I like two types of dry flies, high floaters and low floaters. There are dozens of great patterns out there but my favorite all around is the Henry’s Fork Foam Salmonfly. The wing is tied with water resistant, high visibility EP fibers. A good low floater is the Dornan Water Walker Salmonfly which has a thin foam wing which is relatively easy to see even though it sits very low on the surface. If you don’t want to deal with all of the hype of the Salmonfly hatch there are some other places to consider. 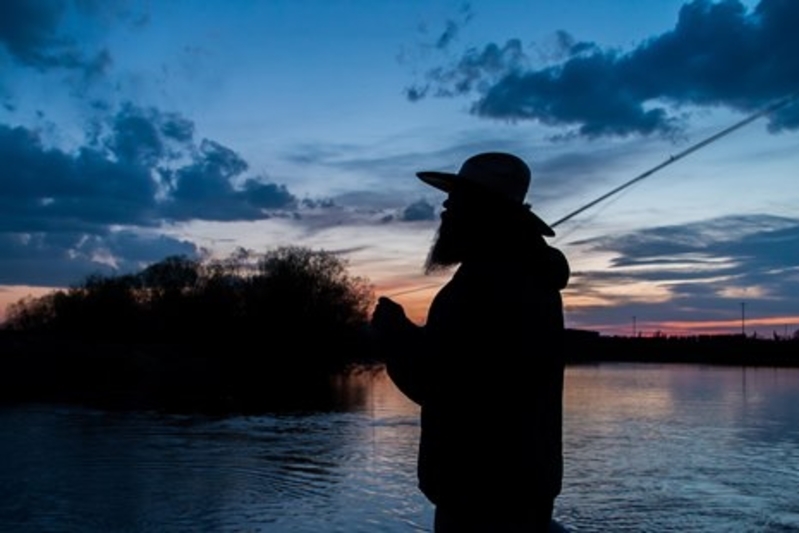 Warm River and the Buffalo River are spring fed streams which offer some great early season fishing. 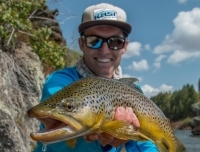 The trout usually aren’t large and are not very particular with regard to pattern making these waters a great option for the less experienced angler. Another thought is the Henry’s Lake Outlet. Henry’s Lake is full and over the course of the last month or so trout have been flushed downstream through the dam. Small bead-head nymphs, parachute dries, and caddis patterns have been producing some nice trout. Please check the fishing regulations because most of the Henry’s Fork above Mesa Falls and the tributaries are catch and release. It is also important to note that the Madison River below Quake Lake opens for fishing this Saturday. I drove up the Madison a few days ago and the water was a little off-color but it looked good. Normally the Madison is pretty high and dirty this time of year but the flow from Hebgen Lake is considerably below normal. I predict the Madison River will provide great fishing. I doubt dry flies will be very productive even though there are some caddis and March Browns showing up. Your best bet will be with streamers, bead-head nymphs and San Juan Worms.